As we mentioned in our post on Friday, this degree program was created as a response to the needs of our undergraduate students and alumni. They told us they wanted to strengthen their skill set to achieve higher-level positions and continue their lifelong learning journeys. The subject matter of organizational change, consultation, and leadership is core to many advanced business positions, so we built a program to help students hone real-world business skills they can immediately apply to their careers. We issued a press release today to announce the news. Check it out to find out more on our new master's degree program and how it will help Philadelphia business professionals continue their education, strengthen their resumes and stand out in a crowded job market. 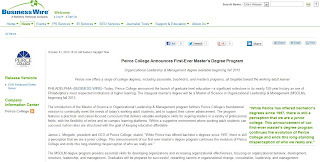 OUR LATEST OFFERING: We're introducing graduate level education at Peirce College. Stay tuned to the blog for more information about the Organizational Leadership & Management graduate degree program and how adult learners can benefit from it. More information about the program can also be found on the Peirce College website, or by contacting the Graduate Studies Admissions Office at Masters@Peirce.edu or 215.670.9325.